On March 29, 1962, a man walking along the beach near the Dutch town of Zandvoort reported a bizarre discovery. He had found, washed up on the sand, a small statue that looked just like the famous statues on Easter Island. Based on the statue's weathered appearance, it seemed that the ocean currents must have carried it all the way from the South Pacific to the Netherlands. By April 1, the discovery of the statue had made headlines, both in the Netherlands and abroad. An expert was flown in from Norway to examine the object, and he confirmed that it was an authentic Easter Island artifact. Meanwhile, the statue had been put on display in the town center of Zandvoort, where it attracted thousands of visitors. But late in the day on April 1, a TV news crew interviewed the man who had discovered the statue, a local artist named Edo van Tetterode. He confessed that he had actually made the statue and planted it on the beach, having been inspired by the Easter Island research of Thor Heyerdahl. The next year, Tetterode created a National April 1st Society, which annually awarded small bronze replicas of the Easter Island statue to those who, in its estimation, had made the best jokes during the previous year. The society remained in existence until Tetterode's death in 1996. Tetterode placed the original Easter Island statue on display in his front yard, where it remains to this day. 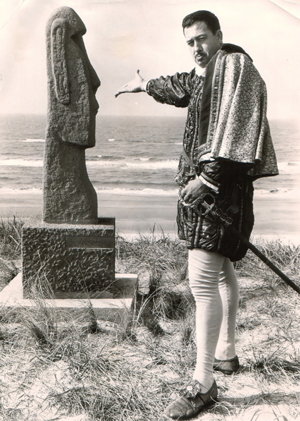 He also created a larger version of the statue which was placed on the dunes at the Zandvoort beach. The video clip below shows Tetterode in 1990, when he appeared as a guest on a Dutch TV show and discussed his Easter Island joke in detail. The interview is in Dutch, but it shows some clips of 1962 footage of his hoax.